There really wasn't much expected from Omaha this year. The media tabbed them to finish last and most prognosticators had them in the bottom three. Yet the Mavericks came out and have played well enough to be at or near the top of the standings for much of the year. Their crowning achievement thus far was the sweep at Denver that thrust UNO to the top of the league and in the national conversation. This weekend UMD will travel to Omaha in hopes of starting 2014 with a good start. Picks by @afiskness. 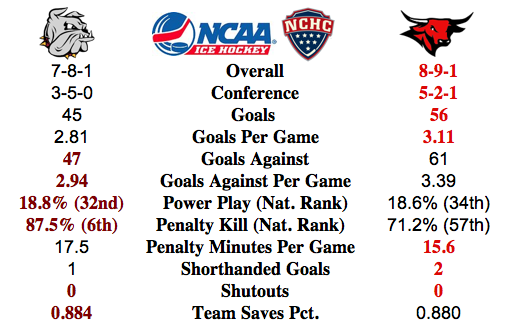 The new year is on us and the NCHC should begin to heat up. This week all eight teams match up in conference games. With this conference there isn't a bad game in the mix. Many of the teams have not played much in the last month and it will be interesting see if there is any rust. St. Cloud State @ Denver: The Huskies are the #3 team in the Pairwise Rankings (PWR) going to #26 Denver and should find a tough battle. The Huskies have been the better team, but I think the Pioneers will have enough in the tank to get a split. Having a full roster now that the World Juniors is over will help them out a lot. Split. Colorado College @ North Dakota: This is the biggest mismatch of the weekend. I don't think the Tigers will be able to get things straightened out this weekend, North Dakota sweeps. Minnesota Duluth @ Nebraska Omaha: This is a great matchup of two even teams. Currently in the PWR the Bulldogs are #28 and the Mavericks are tied at #29. I expect to see a few goals scored each game and the goal tending will be the deciding factor. This looks like a split. Miami @ Western Michigan: The #19 Redhawks travel to Kalamazoo to take on the #32 Broncos. The Redhawks scoring just has been consistent enough for me this year and I like the home ice in this matchup. I will go with a Broncos win and tie (I don't pick shootout winners).